The backyard is fenced and you can enjoy a small, trickling stream with tiny wading pond. There are beautiful views across the valley to Castle Rock Canyon. A 3 car garage provides plenty of parking. Pet friendly with fenced in yard and dog door. 4 wheel drive with snow tires or chains is required in winter - No Exceptions! 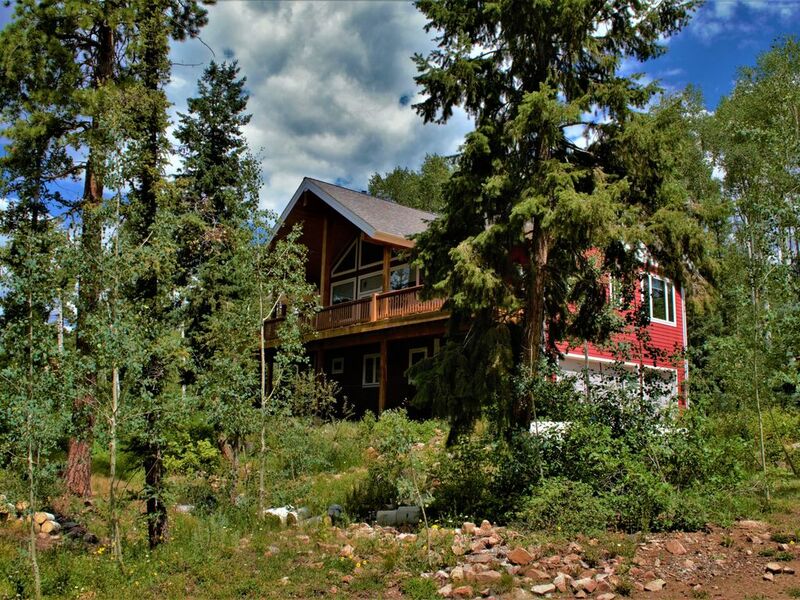 Durango Red Cliff Properties is a small, family owned and operated company thats strives to provide the highest level of personal service and care. This is a beautiful home and a great place to vacation. We came to Durango for my son's wedding at Cascade Village. The Farmhouse was the perfect rental for us! It took about 5 to 7 minutes from driveway to driveway, which was great for the events and for getting back at the end of a long party! The directions are good, which is a good thing since the house really IS secluded. But I can't say enough nice things about the property. First off, squeaky clean. Second, perfect for our group. We were six adults, two of whom are older and not too good at climbing lots of stairs, esp at high altitude. But they did OK by going in and out through the garage. For future travelers .... 3 BRs and 1 bath downstairs, one master suite on the main floor, along with another separate full bath, then the third sleeping area on the "loft plus" level (which is great for kids and young people). Third, decor and furnishings are high end. VERY nice. Plenty of dishes and utensils, and everything is new and in great shape. The whole place feels like a cut above. Fourth, that DECK. Stunning views, comfortable furniture. I didn't get to spend enough time there. Gas-powered fire pit was wonderful. Fifth, any downsides about the property? That's a tough one. For someone having trouble breathing, the stairs are an issue. There isn't a full-length mirror in the house, and normally I wouldn't care, but we wanted to check ourselves out before going to the wedding. We had everything we needed in the kitchen and bathrooms with the exception of bar soap. This was a tiny inconvenience, and I solved that by buying some in town. Wifi connection wasn't always reliable, but we didn't expect it to be perfect given that we were in the woods. So that leaves the only other caveat: get what you need before you leave Durango because it's a half hour one way back to town. Otherwise, this was an excellent choice for us. It exceeded my expectations. Very comfortable, upscale, clean, just terrific all around. I highly recommend it. A beautiful property that accommodated our group very well! Red Cliff Properties did a great job in finding us this property, as our original booking was evacuated because of the fire!! We traveled to Silverton daily for numerous activities there, as no accommodations were available for our large group there. We rode the short train trip from Rockwood to Cascade Canyon. All of the restaurants in Silverton were great! Special Thanks to Jenna at Red Cliff for her help. BEAUTIFUL, COMFORTABLE, but difficult to get to in winter. The cabin is huge and so comfortable for a group of 12 and a baby. Aside from the shower leaking into the downstairs bedroom and there not really being enough heat downstairs, it is very accommodating. It should also be noted that if you are planning to reply on chains instead of snow tires, it can be very cumbersome to constantly put on and take off chains because the highway going down to Durango is well maintained (plowed), so you have to take off your chains. The 2 mile dirt road up Purgatory Lake Rd to the cabin is not and it can be very steep and icy. PS. Broken Handmixer = Lumpy potatoes. This home is a Durango vacation treasure. We had 11 family members enjoying Fall Break together. There was plenty of space, beautiful scenery, an awesome kitchen, and a large deck with a phenomenol view and cozy propane firepit. The master suite was extremely SWEET! I would highly recommend this vacation home. This was a really great house. Secluded and quiet. The living space and kitchen are amazing. The house has a really nice view that you can enjoy from the inside or by relaxing out on the deck. Thank you to the owners for sharing this lovely home with us.